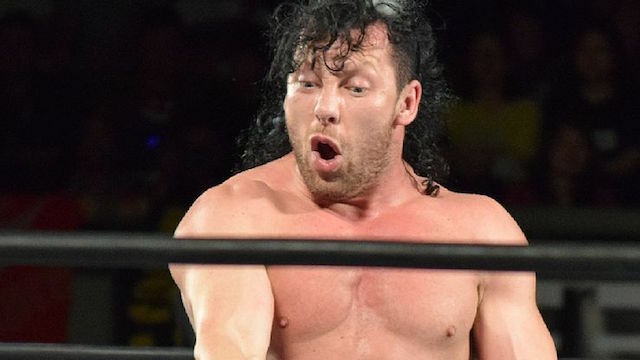 Here Kenny Omega talks about Kota Ibushi and Hiroshi Tanahashi: "You know, I was listening to the previous comment, and I'm hearing all of these strange insider terms: heel, babyface. Oh my God! What does that mean in the year 2018? Look, I exposed myself and I exposed my relationship and deep love and trust for Ibushi in front of the world. And we want to work together, and change wrestling for a brighter future. But hey! One of us should be heel and one of us should be babyface, because that's pro wrestling, right? No! For the third freaking time today, we are all human beings, and it's time to tell human stories. Stories we relate to, and stories that are true to our hearts. This guy (Tanahashi) is playing the role of a hero, but it's all fake. The real man behind Tanahashi isn't a hero. I have things about me that I dislike, I'm not a perfect human being. I am flawed, but at least I can admit it, and at least Kenny Omega, Tyson Smith is exposed to every single one of you, every single night I perform in the ring. And the relationships that I have in my life with the fans, they're all with me. We are all family. He wants to have that separation. I understand that. Old-school mentality, but that's where we differ. Ibushi isn't going anywhere, he's staying with me, and I support his success 100%. But we will continue our success as the Golden Lovers, both as a tag team, and as single performers." Controversial UFC fighter Khabib Nurmagomedov is claiming WWE is trying to sign him. Here Steve Austin breaks down UFC 229: "I'll tell you, man, going into that main event, the money fight, Conor McGregor, the wonderful showman and mixed martial arts guy that he is, super talented cat, taking on Khabib Nurmagomedov. I hope I said that right. A lot of people had Conor winning this fight. I was really wondering to see, you've got to watch that quick left hand, his footwork, his crazy athletic ability. And, man, all the buildup, this thing has been going back for quite a time with that bus incident over there in Brooklyn. And I'll tell you what, man, it was a hell of a damn fight. And Khabib had an answer for everything that Conor could attempt to do and just controlled that fight. He ended up tapping Conor out. It looked more like a neck crank than a choke to me. And Conor tapped out. The dude is humble in defeat, talks up a good game. Super game guy, he's going to be back." In this interview Jim Ross defends his New Japan commentary: "I think one time I confused Yoh and Sho. And, hey, look, if Kelly would've said to me, 'JR, hey, remember Sho is in gold and Yoh is in silver' or whatever, I would've said, 'Thanks'. It wouldn't have bothered me. But Kelly didn't do that out of respect and I get that too and I appreciate that as well. So I mixed up Yoh and Sho once, and I don't know, Kevin, maybe it's just my Oklahoma drawl, I don't know if it's Bell's Palsy, I don't know if it's my lack on concentration. I don't have a damn clue. I can't find any excuses that make some damn sense, why I say 'Marty Shurll'. It's 'Scurll. Scurll!' And I'll tell you, this is no bulls--t, I practiced 'Scurll' in the afternoon just to myself. I thought I had it. I get on the air and I can't spit it out to save my soul, but those are just human errors. I don't think it has anything to do with senility or being unprepared. And the other thing that pisses me off and Kelly wouldn't tolerate it either, when they say, 'You don't care about the brand.' That's the biggest crock of horse s--t I've ever heard in my life." Match #1 The Street Profits' Jaxson Ryker & Wesley Blake. Match #2 Kassius Ohno defeats Raul Mendoza. Kassius moves great for his size and really made Mendoza look good. Multiple two counts each way. Match #3 Dakota Kai & Candice LeRae defeat Reina Gonzalez and Aaliyah. Candice pinned Aaliyah for the victory. Match #4 Johnny Gargano wins by DQ over Lars Sullivan after an intentional ref bump. After the match, Johnny gets a couple of chair shots on Lars. Johnny gets loudest pop of the night so far. Match #5 The Undisputed Era's Roderick Strong & Kyle O'Reilly defeat Oney Lorcan and Danny Burch. Great match! Match #6 Ricochet defeats Adam Cole and retains North American championship. There were some dueling Adam Cole/Ricochet chants, Fight Forever and This Awesome chants. Second best match of the night. Match #7 Kairi Sane defeats Lacey Evans with the insane elbow to retain the NXT women's title. MAIN EVENT Tommaso Ciampa beats The Velveteen Dream to retain the NXT title. Velveteen is playing the face and the crowd loved it. He got the biggest pop of the night and Velveteen just ate it up. At one point Velveteen had Ciampa in a figure four around the ring post and Ciampa tapped. The crowd chants "You tapped out!" Ciampa tries to rollup Dream with a handful of tights but the referee breaks it up. Finally after multiple false finishes going both ways Ciampa gets the win. Amazing Match! Dream is destined to be a superstar and sooner rather than later. Overall a perfectly built card that built to an amazing championship match. Here's a video about Shingo Takagi joining LIJ in New Japan. Here Big Show talks about being a WWE ambassador for the Special Olympics: "In some ways, I do identify with the Special Olympics athletes. Because of my size, because of my presence, I've always been judged before people got to know me. I was 6'2", 220 pounds at 12 years old, and when people found out I was only 12, I still remember how differently they reacted. Sometimes, people would assume that I wasn't intelligent or capable, and that was challenging for me to overcome. As a human being who wants to be part of society, I want to make friends, I want to make people comfortable around me, and I want to learn from people. That's what really hits home for me when I work with our Special Olympians, because some people also have preconceived notions that are simply outdated and not true about these amazing men and women. These individuals are so capable, and one of the main important things I get from working with Special Olympians is their honest-to-goodness sincerity." Speaking to Newsweek, Charlotte Flair talks about her feud with Becky Lynch: "I try not to think about it too much. I'm ecstatic about it, but I don't want to jinx it. I know people are saying that and with every match the story keeps getting better and better, but that's all I could hope for. Especially after SmackDown on Tuesday, it was the only direction that would make sense with the brutality of what happened. And it's perfect for the story between two best friends." Here's a preview of MLW Fusion tonight: "Tonight, October 12th, Major League Wrestling: FUSION returns with another weekly episode, 'Teddy Hart vs. Rich Swann.' This episode will also air on beIN SPORTS en Español next Tuesday, October 16th. During tonight’s episode, Rich Swann looks for payback as he battles the man who gave him a concussion in July. A special appearance will be made by the Hart Foundation. On beIN SPORTS, the program will feature famed American sports broadcaster, Tony Schiavone, as he calls the action alongside Rich Bocchini." And here's a preview for the upcoming MLW show in Chicago. Here Hulk Hogan talks about Scott Hall and Kevin Nash: "Scott and Kevin were hanging out and we just started talking and we said, 'Man, we just, we've never, like, been in a hair salon, like the girls getting into arguments. We've never sat around in a circle and aired our grievances out. I said, 'I know you guys didn't like me when I first got in the NWO. That was quite apparent. We got to be friends; but, we've never really aired our shorts out in front of everybody.' So, I think the Q&A can be kind of crazy. We've never done it in twenty years." Here Brian Cage talks about All In: "I felt like I really got to showcase myself at All In. Tommy Dreamer came up to me afterward and said I MVP'd that match. There was magic in the air with all those true diehard fans. It was such an abundance of fun and appreciation that I've never seen before at a wrestling event."